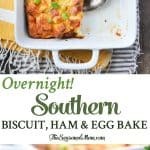 An overnight egg bake with biscuits and ham. Toss the ingredients together the night before then bake it for 10 minutes in the morning. Spray a 9x13-inch baking dish with cooking spray and set aside. In a large bowl, stir together ham, cubed biscuits, cheese, scallions, pimientos, ½ teaspoon of salt, and ¼ teaspoon of pepper. Transfer to the prepared baking dish. In a large bowl, whisk together eggs, milk, nutmeg, remaining ½ teaspoon of salt and remaining ¼ teaspoon of pepper. Pour the egg mixture over the biscuit mixture. Use your hands or a spoon to gently combine the biscuits with the eggs to make sure that everything is nicely coated. You want the biscuits to absorb the liquid. Cover casserole and refrigerate for at least one hour (or up to overnight). Before baking, allow the casserole to sit on the counter and come to room temperature for about 20 minutes while you preheat the oven. If the casserole has been sitting overnight, I like to give everything a gentle stir in the dish to make sure that all of the biscuits are coated with the egg mixture before it goes in the oven. Bake, uncovered, for 45-50 minutes (until eggs are set and top is golden brown). Garnish with fresh herbs just before serving. *I used a 16-ounce can of refrigerated Immaculate brand Organic Flaky Biscuits.